A call to Simon Ting at bluewater brings news that he's taken over the central listing of the 35.43m motor yacht Ann G with a hefty €800,000 price drop. 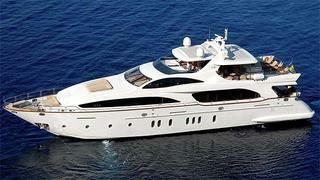 Built by Azimut in 2008, she was designed by Stefano Righini and is RINA classed. A fine example of the yard’s 116 series, Ann G accommodates up to 11 guests in a master suite, two VIP staterooms and two twin cabins with Pullman berths. Two 2400hp MTU engines give Ann G a cruising speed of 25 knots and she’s been immaculately maintained by the same owner and captain since launch. Lying in Antibes, Ann G is down from €6.25 million to €5.45 million.